The Webb Memorial Trust commissioned Edge Hill University’s Institute of Public Policy and Professional Practice to examine civil society’s response to poverty and inequality as part of a wider research project examining the concepts of a Good Society. 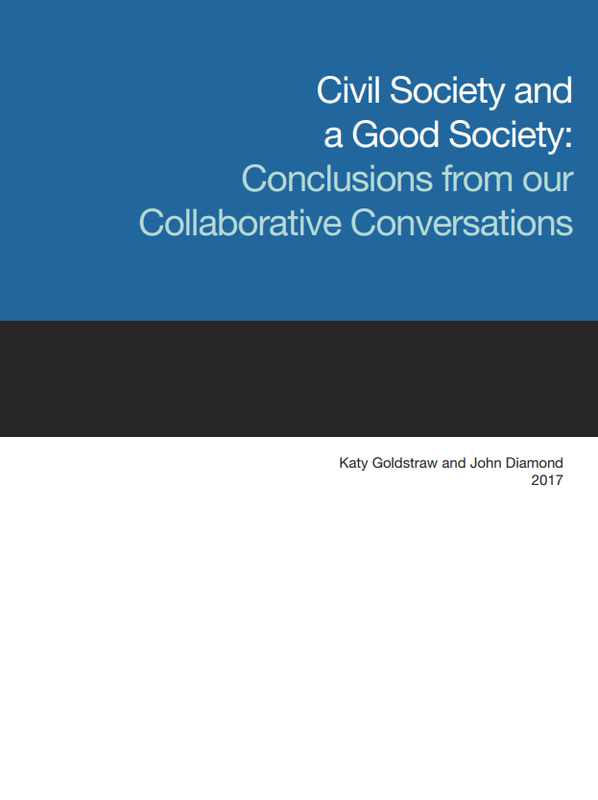 This final report summarises a series of collaborative conversations. This research is one contribution to a number of separate but linked projects funded by the Trust. Katy Goldstraw and John Diamond conducted three intertwined pieces of research. First, an initial literature review. Second, working with civil society groups, the researchers developed a broader understanding of what a Good Society might look like. Third, members of Fairness Commissions were asked to reflect on their progress, successes and potential sustainability, and to consider how they might contribute to a Good Society. Conversations with Fairness Commissions and civil society groups led us to conclude that a strong independent civil society can contribute to a Good Society. These conversations revealed three potentially mutually exclusive visions of a Good Society. First, a Good Society that repairs the current welfare state, restores institutions and re-imagines the Webbs’ extension ladder model of a Good Society. Second, a society based on strong human values of public love, care, tolerance, respect and kindness. This vision of a Good Society reignites the philosophical debate around what a Good Society might look like. By reinvesting in democracy and developing a credible counter narrative to neoliberalism based on human values, civil society can help to build a Good Society. This vision of a Good Society argues that in creating a strong counter narrative to the political status quo, a Good Society can emerge. To create a Good Society, in this vision, we need to reconsider our understanding of society as beyond that of nation state, recognising the globalised heterogeneous world in which we sit. Conversations with Fairness Commissions and civil society groups reveal that collaboration and supportive relationships, webs of social ties, human capital, trust and kindness need to be developed within and between organisations. Here the Webbs’ parallel bars model is redeveloped, with grassroots voices at its core. The third vision of a Good Society might seem more pragmatic. It recognises where we are in terms of welfare reform and uses the social scaffolding of civil society to temporarily alleviate the gaps in welfare provision. In a return to human values as a counter-narrative to neoliberalism, a strong independent civil society offers a powerful resistance to poverty. This resistance creates ‘messy middle grounds’ (Sparke 2008) where the Webbs’ extension ladder is extended and updated into a social scaffolding of value-based organisations. In this model, a Good Society is found in strong collaborations between responsible and ethical organisations. A Good Society develops through the recognition of heterogeneity and diversity, and from a solidarity of tolerance and respect. Hybrid organisations, adept at integrated working, that are no longer sector specialised but expert collaborators operating within a heterogeneous globalised world, will be the ones in this vision to create a Good Society. The homogenous vision of a socially cohesive Good Society that was espoused by the postwar welfare state represents the extension ladder imagined by the Webbs. From behind the scaffolding of civil society, in our updated analogy, a heterogeneous solidarity of globalised hybrid responsible and ethical organisations emerges. These organisations are temporarily covering the cracks in welfare provision, offering a temporary vision of a Good Society.